This is a sponsored post written by me on behalf of Pampers. All opinions are 100% mine. Becoming a mom for the first time is scary. It’s this huge, epic thing that you just – do. The most important job in the world, and there’s no resume, application, screening, or interview. You are just sent home from the hospital with a tiny little new life. In those first weeks and months, that baby is your entire WORLD – you spend hours upon hours feeding, changing, burping, rocking, bathing, and soothing your precious baby. As baby gets older, you get a bit of your life back…maybe even a date with the hubby or a night out with the girls here and there…but your identity is forever changed. You are somebody’s mother. The second time around, I’d argue that it’s almost scarier. You know what to expect – labor and delivery isn’t this big scary unknown thing, you can change a diaper with the best of them, and your baby soothing techniques may be a bit rusty but you’ve still got game. But you already have a baby. Your firstborn. And she’s perfect. How could this second baby even come close to stealing as much of your heart? You’ve got a good thing going on with your trio – Mommy, Daddy, and a beautiful child. You were just feeling like you had a handle on this parenthood thing, and now here comes this new baby, an outsider, who is going to turn life upside down again. And then there’s the guilt-inducing, gut-wrenching, horrible question that you almost don’t even dare to ask yourself – how can I possibly love this baby as much as I love my first child? Whether baby #2 was planned or not, I think almost every mom of more than one kid experiences this unspoken fear. To be honest, I was always a little bit “judgey” of only-child families until we started talking about when to start trying for our second baby, and then I understood the feeling of wanting to keep our perfect little family just the way it was. 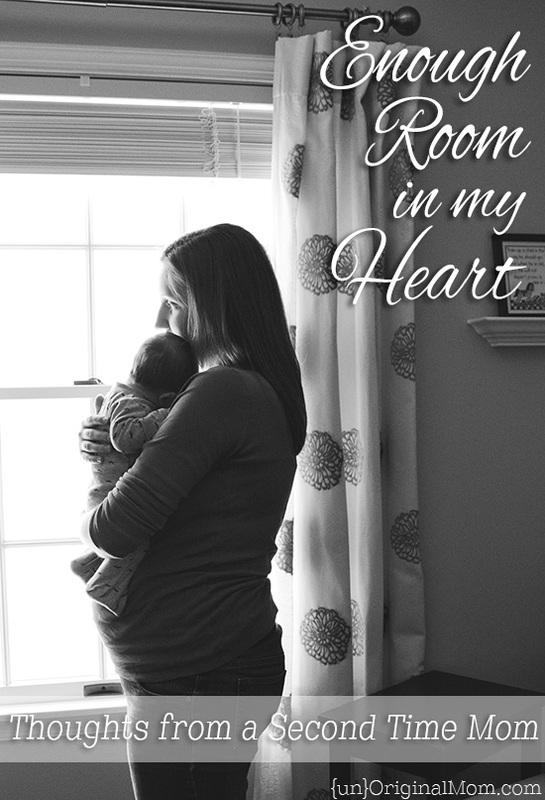 I was afraid that there just wasn’t enough room in my heart to love another baby as much as I loved my daughter, or that this baby would take away part of my heart from my daughter, and inklings of that fear remained in the back of my mind throughout my pregnancy. And then – our precious little boy was born. We didn’t know we were having a boy (and I have only sisters and a sister-in-law, so boys are very foreign to me! ), so for a while I was just astonished at the fact that I had a SON. To be honest, I don’t think I had the same obsession and infatuation with him that I had with my daughter – I had done the newborn thing before and I’m not a huge fan of newborns anyway – but gosh did I love him. And as we settled into our daily lives, not only did I come to love him more and more, I grew to adore our perfect family of four. I won’t say that it’s as instant as the flipping of a switch inside as soon as you hold your baby the first time. It may not be fireworks the first moment he gazes into your eyes. 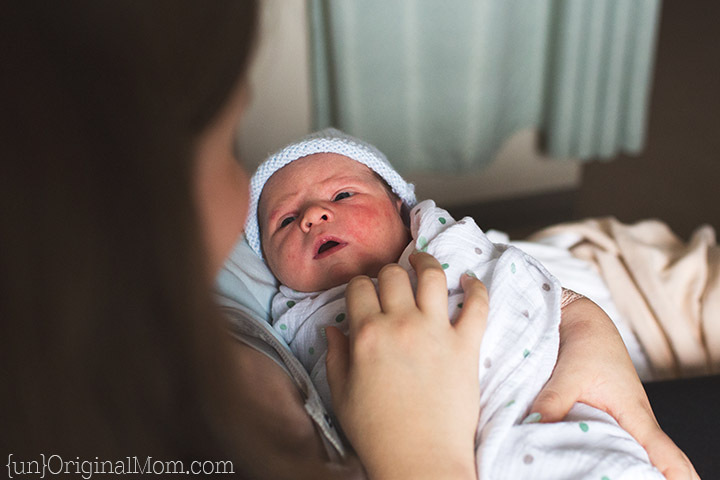 I think that idea of “love at first sight” is a wrong characterization of loving your baby, because I know people that have felt like it took a few weeks or even months to feel a real deep love and connection with their baby (even with a first baby). For some people it is instantaneous, and for some it isn’t – and that’s okay. But you will love that baby just as much as you love your other child. And your heart doesn’t have to make room for the love you’ll feel for that second child – it grows to love them both. 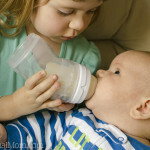 And of course, it makes my heart almost explode to see how much my daughter loves her baby brother! There’s nothing that makes me happier. Are you a mom-to-be? Becoming a mom – whether it’s the first or 6th time – can be both exciting and nerve-racking. Every expectant mom experiences those uncertain and anxious emotions related to one thing or another. Walmart is hosing a web series, brought to you by Pampers Swaddlers, called #MomsFirst. It’s an easy place to find helpful hints, great products, and personal stories from moms just like you and me. As a mom of a toddler and a baby, I could really relate to Erin’s stories – but I love how honest and real ALL of the moms are in their videos! You’re sure to find some great mom stories that you can (or will be able to!) relate to as well. 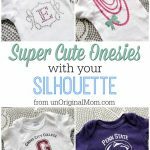 And a quick shout-out to Pampers – I have put both of my babies exclusively in Pampers Swaddlers as newborns, and I’d highly recommend them. So whether you are an expectant mom or maybe just want to bless a new mom with a box or two of diapers, visit Walmart to see their great Pampers deals. Nothing beats tried and true advice from real-live moms, so if you have a minute, check out the stories on the Pampers #MomsFirst page at Walmart.com. If you’re a mom of more than one child, did you experience the same fears that I did before your second baby was born? 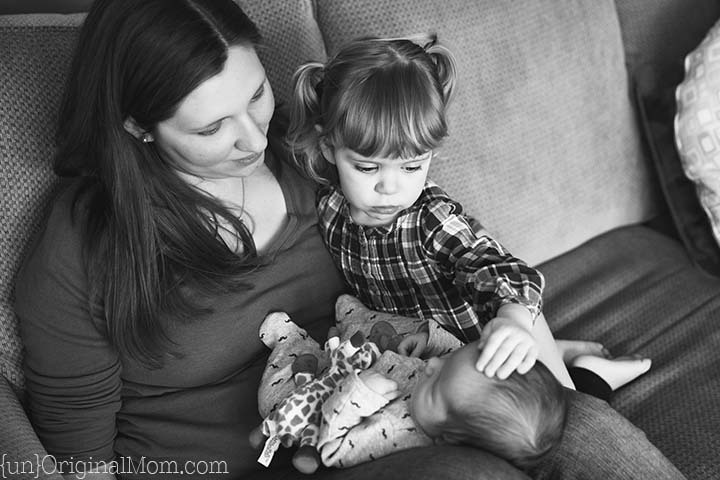 Or if you are expecting a baby, does it help to find other moms that can you relate to your fears and anxieties? 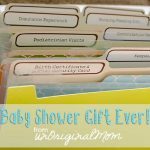 Best Baby Shower Gift Ever! I know that feeling of will I love a second as much as the first. For us our second came a lot later. Our daughter was 6 and would turn 7 only 6 weeks after our baby was due! Also like you second baby was a boy! What do I do with a new baby let alone a boy! I was more scared second time round than the first! Thanks for sharing your story, Helen! I can only imagine that fear grows the older your first child becomes…I had a hard enough time after only having 2.5 years alone with my daughter. 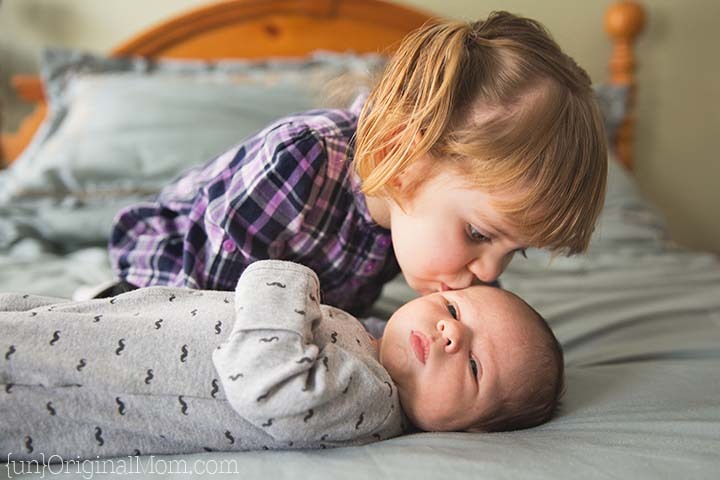 But what’s the most amazing to me is watching how much she adores her little brother…I’m sure it was the same with you…they have such a terrific bond already! I really like this post because I know a lot of my friends have struggled with this, too.